Windows in the Alumni Chapel on the campus of Michigan State University. These three windows are among 38 windows in the Alumni Memorial Chapel at Michigan State University. Designed by architect Ralph H. Calder and completed in 1952, the chapel was built with alumni contributions and dedicated to the memory of MSU students and alumni who fought and died in our country's military service. Its stained glass windows have helped to make the chapel a popular setting for weddings, baptisms, and memorial services. 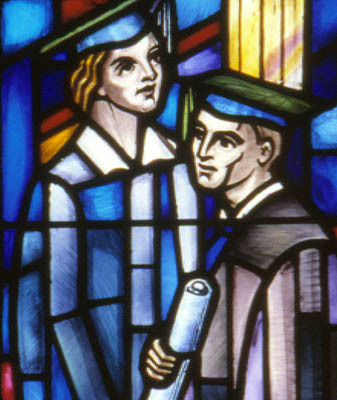 The chapel windows were given by alumni and friends as memorials or by graduation classes and university organizations. Made by the Willet Stained Glass Studios in Philadelphia, the windows were designed by Odell Prather, Marguerite Gaudin and Anthony Mako, who were leading designers with the Willet firm. Ten of the windows depict events in the university's history. 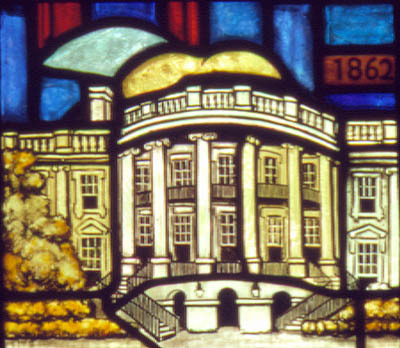 The window on the left, designed by Odell Prather, shows President Lincoln signing the Morrill Act of 1862, giving land to each state "for the support of colleges that would teach agriculture and the mechanic arts." Through the Morrill Act, Michigan Agricultural College (the original name of Michigan State University) became the nation's pioneer land-grant university. 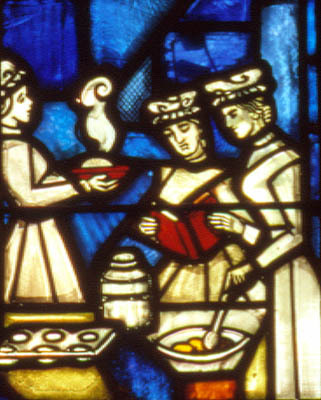 The center window, also designed by Odell Prather, records the admission of women to Michigan Agricultural College in 1870. Various themes are found in the other windows of the chapel. The window on the right, designed by Marguerite Gaudin, is one of three balcony windows expressing the theme of "Faith, Hope and Love." To view other windows made by the Willet Stained Glass Studios, visit the Window of the Month for April 1999 and the Window of the Month for June 1999. Alumni Memorial Chapel, Michigan State University, of East Lansing was registered in the Michigan Stained Glass Census by Bill Heater of Lansing. 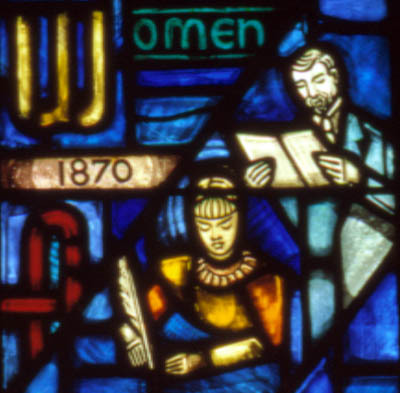 "Early proposal of themes for the stained glass windows, Alumni Memorial Chapel." Hannah Papers. Michigan State University Archives & Historical Collections, East Lansing, Michigan. 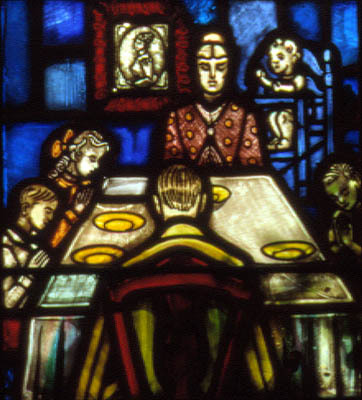 Erickson, Claud R. Article proposing content and purpose of the chapel's stained glass windows. Hannah Papers. Michigan State University Archives & Historical Collections, East Lansing, Michigan. Designs for Alumni Memorial Chapel windows. Willet Stained Glass Studios, Philadelphia, PA. Michigan Stained Glass Census file 92.0003, Michigan State University Museum, East Lansing, Michigan. 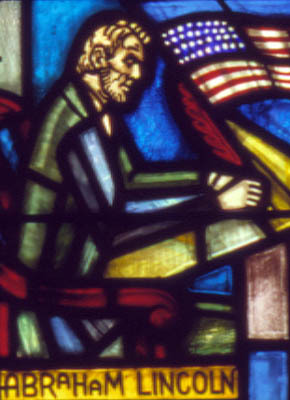 Jones, Robert O. Biographical Index of Historic American Stained Glass Makers. 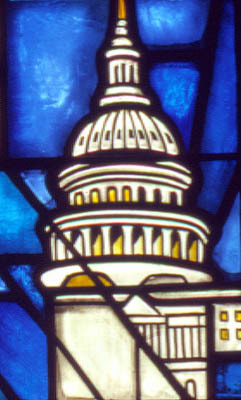 (Raytown, MO: Stained Glass Association of America, 2002). "In Memory of Odell Prather, 1912-2001." Stained Glass Quarterly. Fall 2001, Vol. 96, No. 3, 170-171. Public Art on Campus Committee, Michigan State University. "Public Art on Campus" (2003). http://www.publicart.msu.edu. Stanford, Linda O. and C. Kurt Dewhurst. MSU Campus Buildings, Places, Spaces: Architecture and the Campus Park of Michigan State University. (East Lansing: MSU Press, 2002). Text by Betty MacDowell, Michigan Stained Glass Census, September , 2000.